A New Map of the Seat of War, in the Netherlands, from the best Authorities. 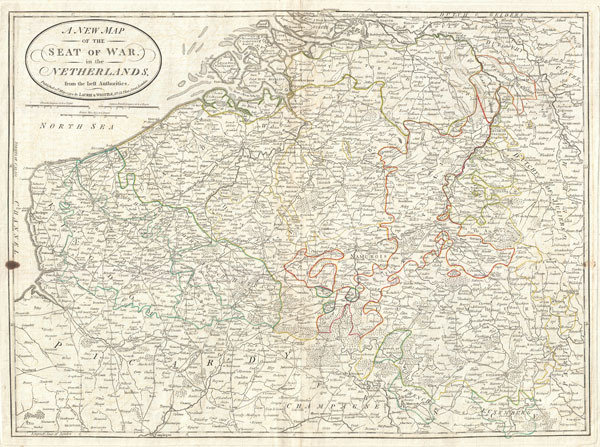 An very attractive 1794 map of what is today Belgium by Laurie and Whittle. Covers from Zeeland southwards as far as the Picardy (France), and eastwards to Luxembourg. Includes the modern day nation Belgium as well as adjacent parts of Germany, Luxembourg and France. Renders the entire region in extraordinary detail offering both topographical and political information. Undersea shoals, canals, swamps, and lakes are beautiful rendered in fine engraving. Color coded according to region. A key and title cartouche appear in the upper left quadrant . Published by Laurie & Whittle for Kitchin's 1794 General Atlas. Very good condition. Light offsetting. Small spot left center. Original centerfold.